API’s for MATLAB® interactive programming environment. ThinkRF provides MATLAB® drivers for connecting to the ThinkRF R5550 Real-Time Spectrum Analyzer and MATLAB® program code examples to get you started towards developing your own. API’s for the NI LabVIEW® system design software. Easily and quickly integrate the R5550 analyzer into your existing or new NI LabVIEW® based acquisition, measurement, automated test and validation systems. 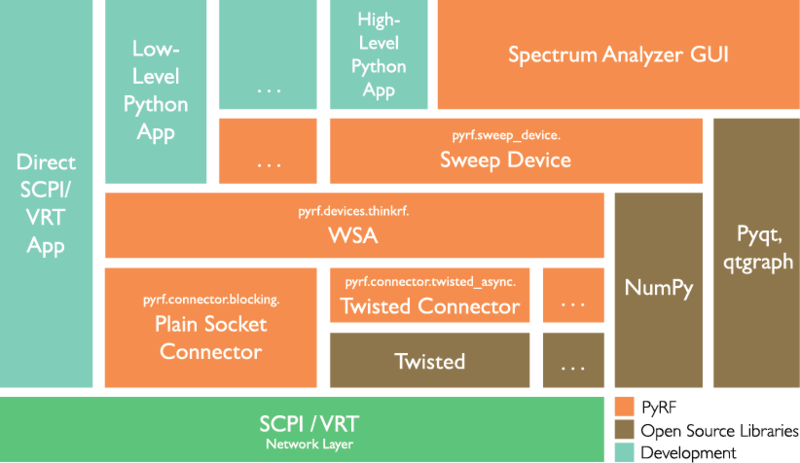 Underneath our rich set of APIs and programming environments is the C/C++ driver and DLL which abstracts the SCPI command and VITA VRT dataflow from the R5550 analyzer. The C/C++ driver is openly available to you in source code allowing commercialization of solutions through BSD open licensing. Compliance with standard protocols provides you both multi-vendor independence and device interoperability. ThinkRF supports the Standard Commands for Programmable Instruments (SCPI) for control and the VITA-49 Radio Transport (VRT) protocol for data flow. ThinkRF provides extensive documentation and examples for programming and interfacing at the SCPI and VITA-49 VRT level. 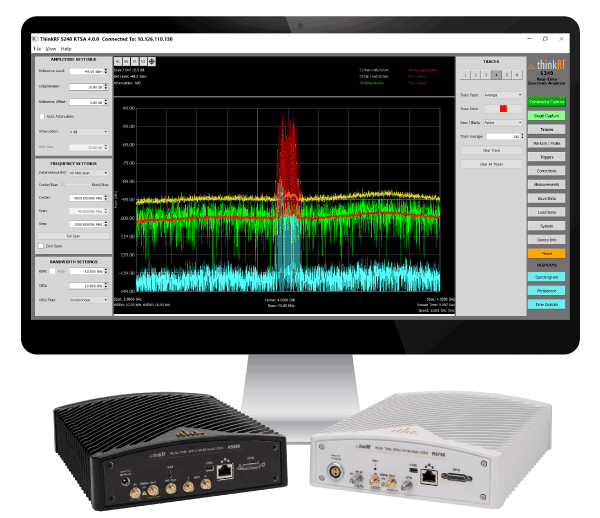 PyRF enables rapid development of powerful applications that leverage the new generation of measurement-grade software-defined radio technology. It is built on the Python Programming Language and includes feature-rich libraries, example applications and source code and is openly available, allowing commercialization of solutions through BSD open licensing.